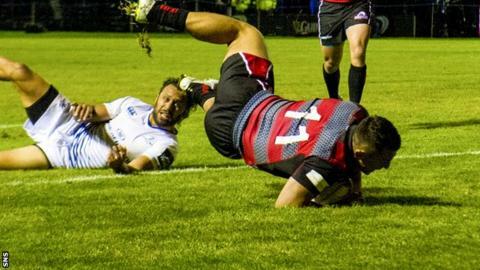 Edinburgh coach Alan Solomons was delighted to see Damien Hoyland score two tries as Edinburgh beat Leinster 16-9 in their opening Pro12 game. In a game with a series of missed penalties, the 21-year-old made the difference at Meggetland. "It's fantastic," Solomons told BBC Scotland. "That's the big thing I've said in my vision for this club is becoming a bolder, sustainable club through our young Scottish talent." He continued: "To see Damien play, and this is the ground he grew up on, to see him score two great tries is fantastic." Solomons knows the performance was far from perfect, and had Isa Nacewa been more prolific with his penalties, Leinster could have edged it. He said: "I want to thank all the fans, really, really appreciate it. Their support means a great deal to us and is a big encouragement to the team and there was a nice atmosphere here tonight. "I think we have got to back this up with another win. Obviously we've got to go to Triviso which is never easy. There are a lot of areas in our game which we need to improve. "We gave away far too many penalties, I think we had four penalties at the breakdown in the opening 17 minutes. Too many little errors, which denied us territory and possession. So there's a lot to work on, and our feet will certainly be on the ground. "I'm very, very pleased with the result. Leinster are a good side and I thought they did well tonight. It's important for us to come away with a win, particularly when we play at home so little bit disappointed we didn't make that last conversion to deny them the bonus point but very pleased with a win. "We've said that this is the year that we've got to evolve our attack and in the friendlies, particularly against Ulster, and again passages tonight especially in that first half were really, really positive so I think we are making progress with that." The driving wind and rain made conditions difficult for both sides, but Hoyland praised his team-mates for the way they dealt with it. He said: "We had to change a few things up a bit. It worked to our benefit in the end as we managed to keep the ball in their half. I think we adapted to the weather quite well. "Leinster are obviously a very high calibre team. Going into this game people expected Edinburgh to be the underdogs but I think we showed people we're going to be strong contenders this season."